NOAH is proud to be a signatory to the UK Food Chain Manifesto, drawn up by organisations from the length and breadth of the food chain, representing farmers and their suppliers, through to food manufacturers and retailers. With little more than 10 months to go before Brexit, the Manifesto emphasises the importance of ensuring the UK’s departure from the EU does not undermine our food production and supply sectors in the UK. Ms Hillier added: “Our businesses need certainty to be able to plan for the future. We support the recent Government proposals to incentivise methods of farming that reduce animal disease and monitor animal health and welfare. In order for the real improvements to animal health and welfare that can be made by increasing the use of a range of preventative and supportive medicines, such as vaccines and pain relief medicines, we need to ensure continuity of supply, in the short and longer term, as we leave the EU. 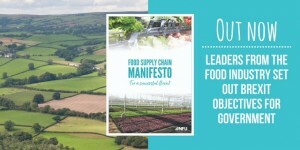 “The manifesto warns that if the food chain as a whole is not championed, Brexit will be bad for the country’s landscape, the economy and wider UK society. But, get this right, and we can all contribute to a successful future,” she said. to ensure businesses operate under an efficient and proportionate regulatory system that is centred on scientific evaluation and that incentivises innovation and competitiveness. Keep up to date with all the latest NOAH news.